Before he cast his ballot in 1860, Abraham Lincoln cut off the portion of it pertaining to the presidential race. Lincoln did not campaign for office, nor did he even vote for himself. Back then and for much of the nation’s history, it was considered unseemly to seek the presidency openly, obviously and energetically. It was a hypocritical charade, of course, but also in some ways a useful social myth: “The office seeks the man.” It wasn’t until Franklin Delano Roosevelt that a major party nominee even accepted his nomination in person. Needless to say, the game of charades is over, the social myth has been exploded, and the tradition of non-campaigning has gone the way of the dodo. Campaigns for president are declared and openly waged months before the primary season begins at the start of the election year, and the musing about the next campaign — and the not-so-hidden organizing — begins almost immediately after presidential ballots are counted each quadrennium. We’ve just tried to justify what we’re about to do. Even though it’s absurdly early, we couldn’t resist taking our first look at the 2016 presidential contest. This week and next we’re unveiling our initial ratings of the field by offering eight contenders for each party’s nomination. That’s 16 total candidates for 2016, plus a couple of wild cards. We’ll start with the Democrats this week — Hillary Clinton and everyone else — and address the Republicans next week, where we’re leaning toward putting a name at the top of the list that might raise some eyebrows. This is the beginning, not the end, of the process. If you think our current ordering of POTUS candidates will stay the same over the next three years, you haven’t been following presidential politics very long. We’re the Crystal Ball, not Nostradamus, and even his quatrains were vague about the distant future. But it’s the fun of the chase, the goal of the game, to conjure up 2016 on the basis of sparse tea leaves at the bottom of the 2013 cup. Democrats made history in 2008. We suspect they will want to do so again in 2016, which is just another reason why Hillary Clinton is such an obvious front-runner for her party’s presidential nomination, as long as she wants it. After electing the first black president, there is going to be a strong desire on the left to elect the nation’s first woman president. Psychologically, the recent death of former British Prime Minister Margaret Thatcher may reinforce this thinking. As an undergraduate female student said to one of us, “The U.K. got its first woman head of government in 1979. It’s more than 30 years later, and the U.S.A. is still waiting for its first woman president.” If this “our turn” sentiment takes hold, it cannot hurt in a nation where women are 52% to 53% of the usual general election turnout. And the Democratic electorate is far more disproportionately female. 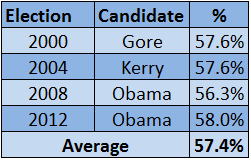 Since the 2000 election, nearly three of every five Americans who cast ballots for the Democratic nominee for president have been women, as shown in Chart 1. Republicans could scramble this equation by nominating a woman for president. But based on the list we’ll release next week, that’s very unlikely. What about a female VP nominee? After Geraldine Ferraro (D-1984) and Sarah Palin (R-2008), the novelty of that ploy has probably worn off. Not surprisingly, it’s the Democrats — with their women-dominated base — who are more likely to break the presidential nominee glass ceiling. While there are back-up Democratic female candidates if she doesn’t run, Hillary Clinton is in a commanding position to fill the role for 2016. Clinton’s strengths are obvious, although let’s not forget that she was also a strong favorite going into the 2008 election. Had Clinton run a better campaign — one that focused on playing the long game of winning delegates, contest by contest, especially in the caucuses — she very well might have fought off Barack Obama’s challenge. Emotions ran high during the final months of the primary battle, and Clinton was disliked by many elements of the party by the end of the contest. The wounds appear to have healed over time — helped along not only by her performance as Obama’s secretary of state but also by her husband’s energetic backing of the president last year — but one could imagine a perfect storm of events, and a perfect Democratic insurgent, upsetting the Clinton coronation. However, no fair analyst can take such a contrarian argument against a Clinton nomination very far at this early point. If she runs, she is a clear, perhaps overwhelming, favorite to win her party’s nomination. Period. If Clinton is not in the race, the default early frontrunner has to be Vice President Joe Biden, who might inherit a good deal of President Obama’s support, at least initially. The degree of the president’s backing could also matter; would Obama give his lieutenant a full-throated endorsement? Yet Biden has serious drawbacks in the nominating contest. His quirkiness and gaffe-making aren’t absolute barriers to victory. Many Democrats seem to find those qualities endearing — though they drive Republicans and independents wild. Fundamentally, it is Biden’s age that will generate the most doubts: He’ll be 74 by Inauguration Day 2017 — the latest (by far) that any president would start a first term. If Biden served two terms, he would be 82 upon leaving the White House — not unprecedented at all for world leaders but highly unusual for the United States, and the Democratic Party in particular. Perhaps Biden will do something unusual, such as announcing well in advance his choice for vice president. We can see the advertisement now — Wanted: Young energetic woman or minority to serve apprenticeship under likely one-term president. Or maybe Biden releases a list of those from which he’ll choose a VP, all of them conveniently in the categories we’ve suggested. Seriously, can you imagine a Democratic ticket composed of two straight white males, ever again? We cannot. In fact, we suspect the Republicans’ days of nominating two white males on the same ticket are over, too, unless they are determined to lose in an increasingly diverse electorate. Frankly, considering the emphasis Democrats place on diversity, Biden and the rest of the non-Hillary potential nominees we list in Chart 2 might have problems electrifying the party base, unless an exciting veep candidate were added. Biden, Gov. Andrew Cuomo (NY), Gov. Martin O’Malley (MD) and Sen. Mark Warner (VA) certainly have the qualifications to be president, or at least they are as qualified as any number of recent presidents, but expectations have changed along with demographics. Let’s say Hillary shocks us and doesn’t run. Are there any surprise possibilities on the horizon for Democrats who could add some spice to the oatmeal candidates we’ve mentioned so far? We’d better keep an eye on Sen. Elizabeth Warren (MA). Warren’s gender, liberal politics and consumerist record fit the Democratic primary electorate a lot better than a moderate like Warner or even Cuomo, who has frustrated some Democratic activists by not being sufficiently partisan. Another female U.S. senator, Kirsten Gillibrand of New York, is sometimes mentioned as a dark horse, though Warren is much better-known and would motivate the base to a far greater degree. •Next in line? Will Obama back him? We have included Gov. John Hickenlooper (CO) on this list as a wild card, but that place could just as well have been occupied by one of the Senate’s Udalls (Tom of New Mexico or Mark of Colorado) or by the colorful populist, former Montana Gov. Brian Schweitzer, whom we have included in a lower tier on our list. Given the clear East Coast orientation of our formal list, we can imagine a westerner shaking up the race, especially because the West Coast and, increasingly, the Inner West states of Colorado, Nevada and New Mexico are becoming major parts of the Democrats’ Electoral College equation. Despite the Democrats’ growing demographic edge (youth support and larger minority voting blocs), it’s not easy for any party to win the presidency in three consecutive elections. The Republicans did it from 1980-88, and the Democrats won the White House in five straight elections from 1932-48 (preceded by three straight Republican victories from 1920-28). Much will depend on the state of the economy and President Obama’s popularity: If Obama leaves office unpopular, like George W. Bush before him, any Democrat — including Clinton — will have a hard time trying to win what would effectively be Obama’s third term. If Obama is relatively popular, like Bill Clinton was in 2000 and Ronald Reagan in 1988, a Democrat would be well-positioned though not guaranteed to win. Therefore, for the time being, the best thing any of the potential Democratic candidates can do to create a winning environment in 2016 is to help Obama succeed. The fate of Obama’s presidency and the fate of the eventual 2016 party candidate are closely tied — and that will be true whomever Democrats pick to be their new standard-bearer.